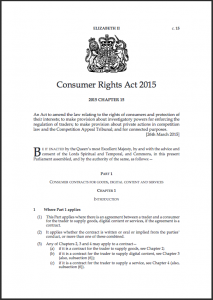 Home / Blog / Running an SME / Is Your Business Ready for the new Consumer Rights Act? This new law is significant: it introduces new rights for consumers as well as consolidating a lot of existing legislation, and it applies to almost all contracts between traders and consumers. It comes into force on 1st October 2015 and affects all traders that supply goods, services or digital products to consumers. It also covers Unfair Terms in contracts. Over the coming month we will be publishing guidance for businesses who trade in Goods, Services, and Digital Products. You can follow this blog or sign up for our enewsletter below, to get the updates. This entry was posted in Running an SME and tagged consumer rights act, legal guidance. Bookmark the permalink. In order to make weather forecasters look good.